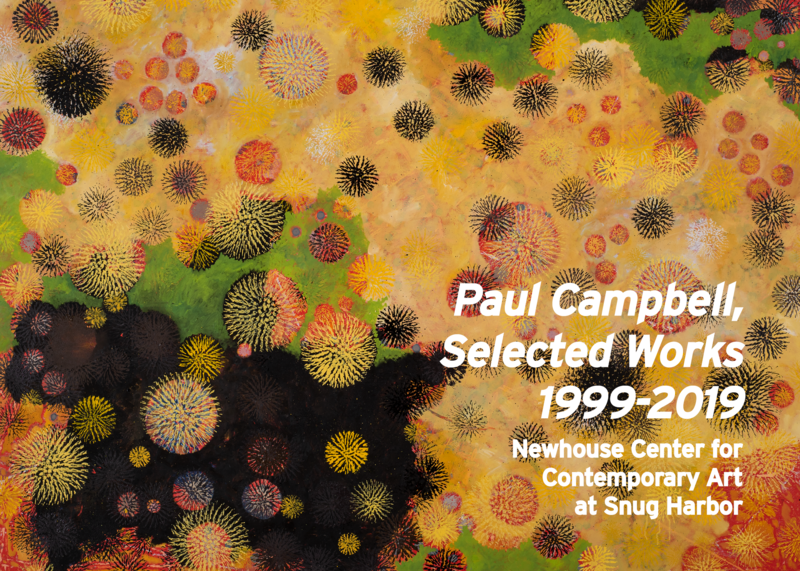 This exhibition surveys the work of NYC-based painter Paul Campbell from 1999-2019, with an emphasis on new work. Since 1998, Campbell has used remote control toys, spiky plastic balls, string, GPS tracks, and other non-conventional tools to create works that simultaneously pay homage and parody the great abstract painters of the past. He combines non-traditional and traditional painting methods to create hybrid images. Although the works are abstract in appearance they often suggest elements of nature, fireworks, portals into some unknown world, and influences of other cultures and traditions. They represent movement and are a metaphor for connections that exist in our everyday lives. Paul Campbell’s work has been exhibited extensively in the US and abroad. He has exhibited at the Brooklyn Museum, the Danforth Museum, the Rose Art Museum, Site Santa Fe, and Lesley Heller Gallery in New York. His first major solo show in New York in 1999 was called “Remote Control” at Roebling Hall Gallery where he showed paintings made with remote control cars. Campbell has received several grants including the Pollock Krasner Foundation Grant and has participated several international art projects and residencies in Europe, South America, India, Singapore, and China. He has also participated in public art projects including a 65 foot mural on Flushing Avenue at Clinton Avenue in Brooklyn based on GPS tracks and most recently a bus stop was opened featuring his work. Campbell’s studio is located in the Brooklyn Navy Yard in Brooklyn, NY. Paul Campbell, Selected Works 1999-2019 is made possible by the New York State Council on the Arts with the support of Governor Andrew M. Cuomo and the New York State Legislature. Additional support provided by Samuel I. Newhouse Foundation and the New York City Department of Cultural Affairs.